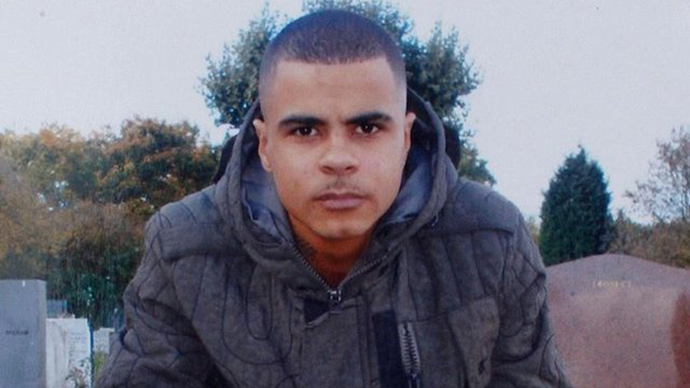 The police officer who killed Mark Duggan, sparking the English riots of 2011, has been cleared of “any wrongdoing” by a police watchdog due to a “lack of evidence.” The report rules Duggan was “throwing [a] handgun away” when shot. A three-year investigation by the Independent Police Complains Commission (IPCC) ruled the shooting of the black Londoner was “appropriate” in the circumstances. Duggan, a suspected ‘Tottenham Man Dem’ gang member, was shot twice and killed after 11 specialist officers stopped a minicab he had been traveling in under the suspicion he was in possession of an illegal firearm. No gun was found on Duggan, but a handgun was discovered in a sock 14ft (4.3 meters) from his body. The IPCC released a report calling for urgent improvements in the accountability of police operations. It said the lack of audio and video material has “made it difficult” to discerned what really happened when Duggan was shot in Tottenham, North London, in 2011. Radio communications between officers during the undercover firearms operation “should have been recorded” the IPCC ruled. In-car video recordings “should be made” in future undercover operations, it added. The IPCC found it “surprising” no police officer saw the gun leaving Duggan’s hand, but the report found “no credible evidence” to propose the weapon had been planted. The officer, known as V53, said he shouted “armed police” and saw Duggan holding an object in his right hand, which he believed was a gun. The IPCC said its investigation “had no evidence which undermines the accounts provided” by the officer in his statements. In a Mail on Sunday investigation released last week, it was revealed that Duggan’s alleged gun supplier had used the same weapon a week before Duggan died. The alleged supplier, Kevin Hutchinson-Foster, previously faced firearms offence charges. However during his trial at the Old Bailey, the charges were mysteriously dropped at the last moment. The police and Crown Prosecution Service (CPS) “refused to explain why” and said it “cannot locate” the paperwork which set out the cause for their decision. Police “missed the opportunity” to stop Foster, as they had CCTV footage of the gun suppliers’ alleged offences. IPCC says there's evidence two detectives failed to "act promptly" to investigate assault by Kevin Hutchinson-Foster who supplied gun. “It seems to us the police tried to edit Kevin Hutchinson-Foster out of the story, to make him disappear. Why?” Mark’s aunt, Carole Duggan, asked. Duggan “may not have been able” to get hold of the gun at the time that he did if Hutchinson-Foster was stopped. Hutchinson-Foster has since been found guilty of supplying the gun to Duggan. The family anticipated “the IPCC would say the shooting could have been avoided,” as it was highlighted in the Mail on Sunday investigation. “It was the latest in a long line of disappointments,” she added. “IPCC have been working on this report for three and a half years since Mark was shot dead and this is what they have come up with,” she added. @unknown_callers he was in possession of a yellow box given to him by a police informer who was allowed to walk away. Mark did not open box. The IPCC’s report has given the MPS “an opportunity to improve” and recommendations will be “carefully reviewed” by the police and the Association of Chief Police Officers, Met Assistant Commissioner Patricia Gallan said. If implemented, the recommendations would “not only shorten the investigative process, they would provide investigators with mediate, accurate and incontrovertible evidence, which would be benefit to all,” she added.